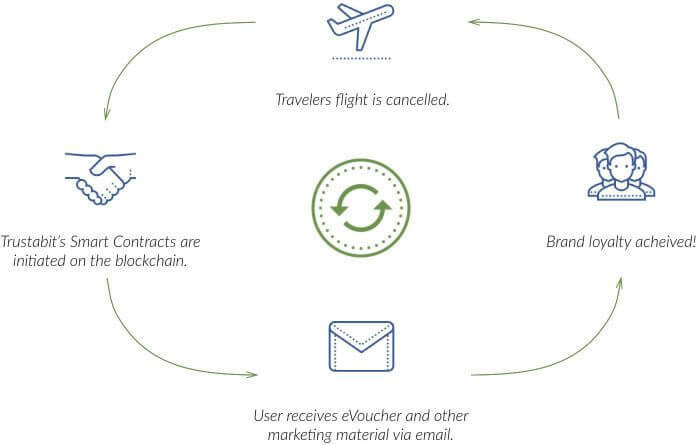 TrustaBit is a state of the art software solution that will give airlines the opportunity to automatically issue vouchers to passengers when their flights are canceled or delayed. The total passenger rights market is estimated to be $3.3 billion annually. Since 2013, AirHelp has collected $85 million in total compensation from passengers who have had their flights delayed. AirHelp functions as a middleman; the passenger provides information their flight to AirHelp, who then works directly with the airline to get compensation on the customer’s behalf. To date, a total of 1.3 million passengers have used this service and they have paid AirHelp a fee of 25% of the total amount collected. These numbers show that passengers are willing to pay extra for a trust worthy digital service that will give them what they are owed. By using our software, we want to nurture back the travelers emotional connection to your airline. When you deploy TrustaBit into your environment, users can be compensated immediately based on set business criteria. The vouchers will be sent to their email address immediately when their flights are delayed or cancelled without the need for them to call into a call center or to fill out a form. This will allow you to make things right with the passenger the first time to increase brand loyalty.